Every week as I check out my groceries, among the TV Guides and Oprah magazines, a new batch of glossy, gossip rags blare at me from the checkout counter. I don’t give them much notice, and the ones I do notice are pretty laughable. They range in sensationalism from bad to worse but the worst of these is likey The National Examiner, which is probably the most outrageous. The covers of this particular tab specializes in paparazzi shots that capture celebrities at their worst. This week’s caught my eye not for who’s got cellulite or the latest scandal, but for the latest in their most morbid, and what appears to be continuing series: “SAD LAST DAYS!” They trot these out every few weeks or so, guess who was on the cover of this weeks? Now, I didn’t bother to read the actual article, and I wouldn’t spend a penny on them*, but what bothers me most is that whenever a celebrity’s mortality is truly or falsely at stake, this particular tab insists that their “last days” are always ‘Sad’ ones. Because of course, ALL celebrities cannot come to a good end. They must suffer horribly because they are rich and famous. I got news for the National Examiner. Everyone ages. Everyone dies. And not every celebrity can look 100% perfect at every outing. And no matter HOW they look, you can’t condemn them to death just because they’re having a bad hair day or more wrinkles than they used to. Yes, of course many beloved celebrities are not as young as they used to be, but you know what? They’ve worked hard for their success, they’ve made millions of people happy, and above all, they’re happy with themselves! (Even if some of them are sick! **) So lay off this crap! Or if you must peddle it, go digital and save a million trees! Mr. Nimoy, Sir, I presume from your recent tweets that you’re fine. But I think you, Ed, Michael, Marjorie, Mary, Suzanne, and Dolly should sue these fools. You don’t deserve this. 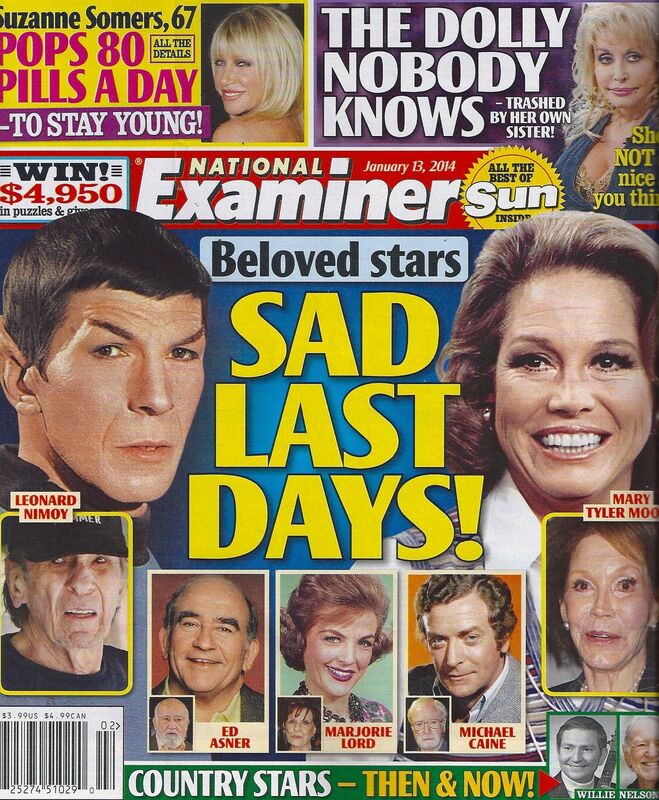 This entry was posted in Leonard Nimoy and tagged Ed Asner, Leonard Nimoy, Marjorie Lord, Mary Tyler Moore, Michael Caine, National Examiner, Sad Last Days, tabloids, trash. Bookmark the permalink. I just saw Ed Asner a month or so ago at a restaurant here in LA with his family-happy, active, and having a great time. Hardly at a �sad end�. One of the things I love about Nimoy is he has never tampered with his great face which has enabled him to be age appropriate as the Trek movies unfolded. I interviewed him about 40 years ago and have been a fan ever since. Theresa Victor was handling his fan mail back then and was a wonderful person. Your TrekkerScrapbook is wonderful. I guess we are all aging �Trekkers�. Thank You Waltona! Lovely to hear from you! And Thanks for your kind comments 🙂 I’ve been doing this blog for a couple years now and I’m always happy to hear from someone new! As you can see, this blog is a tad Nimoy/Spock centric, so when I spotted that tacky tab at the grocery this week, I had to comment! Glad to know Mr. Asner is fine (I never doubted it!) Also, how lucky you were to interview Mr. Nimoy! Oh, If I could have a 10 minute interview with him, I’d be in bliss forever! Thanks so much for sharing! Excellent comment Corylea! Yes– I’m sure most celebrities ignore this tripe, and Mr. Nimoy strikes me as a very laid back person, so this would probably just roll off his back. He surely lives every day to the fullest, as we all should! I noticed the rag while standing in the grocery line the other day. “Wait a minute!” I thought… I didn’t know he was even dead! I consider it a good reminder that I live in a world filled with incredibly stupid people. I had the same reaction. I came home and asked my husband if he had heard that Leonard Nimoy had died. Then it became time to hit the web. All I could think was that we needed Sheldon to clone Leonard Nimoy from the napkin.